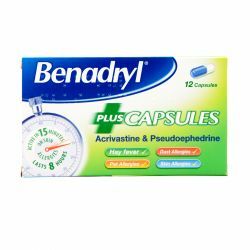 Benadryl Plus is a blue and white capsules which contains the two active ingredients acrivastine and pseudoephedrine. 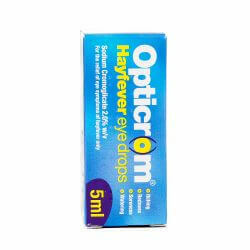 Acrivastine is an antihistamine which helps to relieve allergy symptoms such as sneezing, running nose and watery eyes. Pseudoephedrine is a decongestant which relieves nasal and sinus congestion. 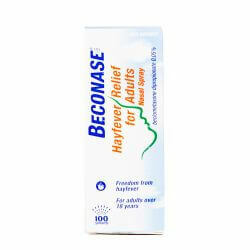 Benadryl Plus is suitable for use by adults and children over 12 years old. Benadryl Plus should be kept out of sight and reach of children and should not be stored above 30 degrees celcius. Benadryl Plus are for oral use only and should be taken with water. The recommended dose is to take one capsule up to three times a day. The capsules should not be chewed. If you take too many capsules you should contact your doctor or A&E immediately. If you forget a dose, take the next dose when needed provided you only take a maximum of three capsules in a 24 hour period. Do not double dose. The active ingredients in Benadryl Plus are acrivastine and pseudoephedrine. Other ingredients include lactose, sodium starch glycollate, magnesium stearate, gelatin, titanium dioxide and patent blue V.
Benadryl Plus should not be taken if you are allergic to any of the ingredients in the medicine. You should not take the capsules if you have had an allergic reaction to any other antihistamines, have very high blood pressure or severe heart disease, if you are taking, or have taken in the last two weeks, drugs for depression or if you have kidney problems. You should speak to your doctor or pharmacist before taking Benadryl Plus if you have high blood pressure or heart disease, diabetes, an over active thyroid gland, if you have glaucoma or prostate problems or if you are taking alcohol. You should make sure to mention if you are taking any other medicines, including medicines obtained without a prescription, especially medicines to treat high blood pressure, congestion, asthma, stimulants, appetite suppressants, mood disorders, anxiety or sleep disorders. You should speak to your doctor or pharmacist if you are pregnant or breast-feeding before taking these capsules. As with all medicines, Benadryl Plus can cause side effects, although not everybody gets them. You should stop using Benadryl immediately if you notice any signs of an allergic reaction. Side effects include hallucinations, skin rashes, trouble with passing water and restlessness. If any side effects you get become severe, or you get any side effects not listed, stop taking the medicine and speak to your doctor immediately.